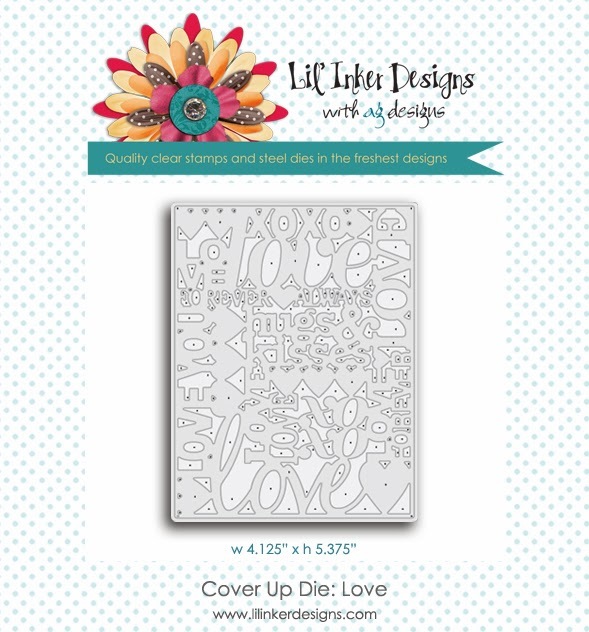 Welcome back to the last day of the December Lil' Inker Designs release! Today I have several more products to feature using the newest releases from LID. I have heard lots of great things about this release! I'm glad you are liking what you're seeing because I sure do think Laura has outdone herself with this release! If you are following along in the blog hop, you should have come from our guest designer's blog Jingle!! It's been great having her join us this month! Hasn't her work been spectacular? If you'd like to start at the beginning of the hop, visit Laura's blog. There are prizes up for grabs! To be eligible to win, just leave a comment along the hop. The more comments you leave, the better your chances are of winning! 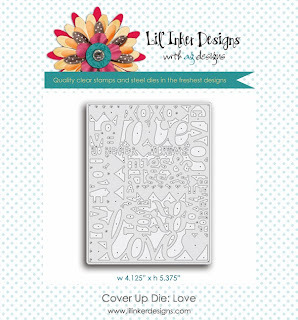 My first card today features the Cover Up Die: Love, Love Tags, Floating Hearts Die & the Love Things Sentiment set. I was looking for a perfect shade of pink for my card and wasn't coming up with what I wanted until...I found in my stash a large stack of origami paper with so many color choices. In it was this pink paper. The thing that is really nice about this paper is it is thin and it easily cuts these intricate dies! I used the cool Love Tags die for my tag. It's hard to see on this card (especially since Flickr isn't working and my photo is a little blurry) but it impresses hearts all around the tag! So cute! I stamped the adorable sentiment from the Love Things set. 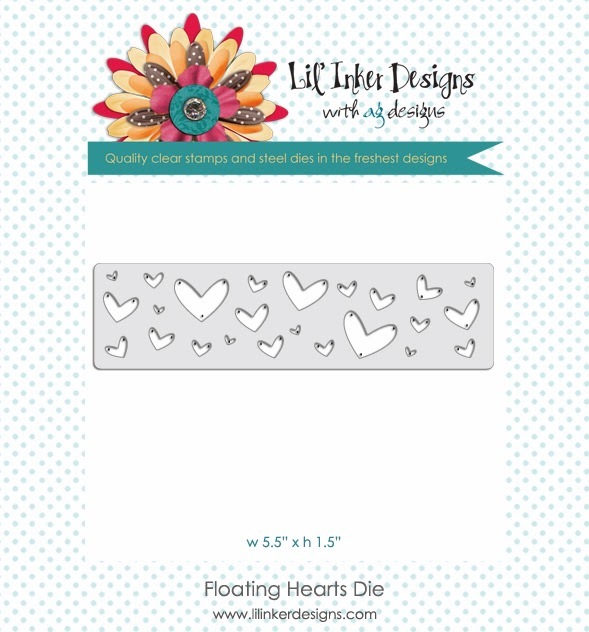 The red glittery hearts were die cut from the Floating Hearts die. This last card is a mini card measuring 4 1/4 x 3 that I die cut first with the Stitched Mats: Rectangle dies. I then stamped the sentiment from the new set called The Fine Print. The sentiment reads, "You're Not Just My Friend, You Are My Best Friend Ever". I stamped the stripes with the Mom Dad Sentiment set and then tied some of my favorite Twinery twine, Gold Shimmer, around the card. That wraps up our release! Thank you so much for joining me this week! Don't forget to leave a comment for your chance to win a great prize from the LID store! Your next stop on the hop is over to Karen's blog! Hello! 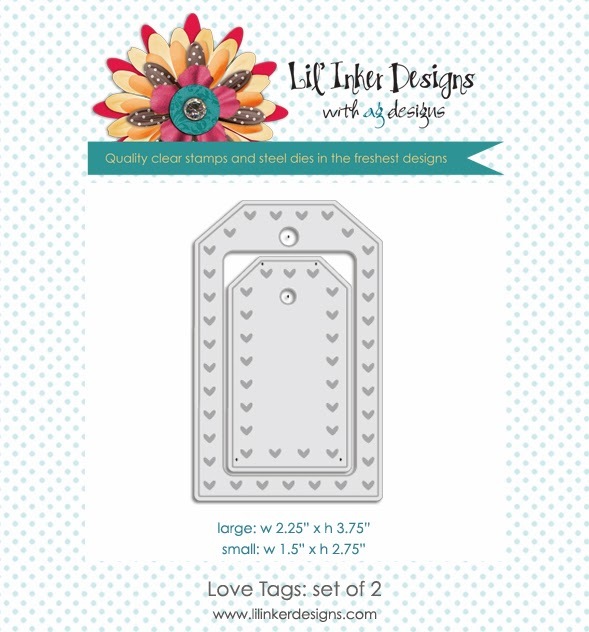 Welcome to Day 2 of the December Lil' Inker Designs release! What do you think of this month's release? Pretty fun! If you are following along in the blog hop, you should have come from our guest designer's blog Jingle!! If you'd like to start at the beginning of the hop, visit Laura's blog. There are prizes up for grabs! To be eligible to win, just leave a comment along the hop. The more comments you leave, the better your chances are of winning! Today, my cards focus on a cool new sentiment set that I love!! It also coordinates very well with the Lil' Inker Stitched Star dies that were previously released! I LOVE the chalkboard look! When I first saw these stamps, that was the first thing that popped to my mind and so of course, I had to make at least one chalkboard card for this release. I started with a piece of patterned paper that was already chalkboard like. I then stamped the star image from Notebook Doodle Stamp Set repeatedly in random patterns and colors (with pigment ink). 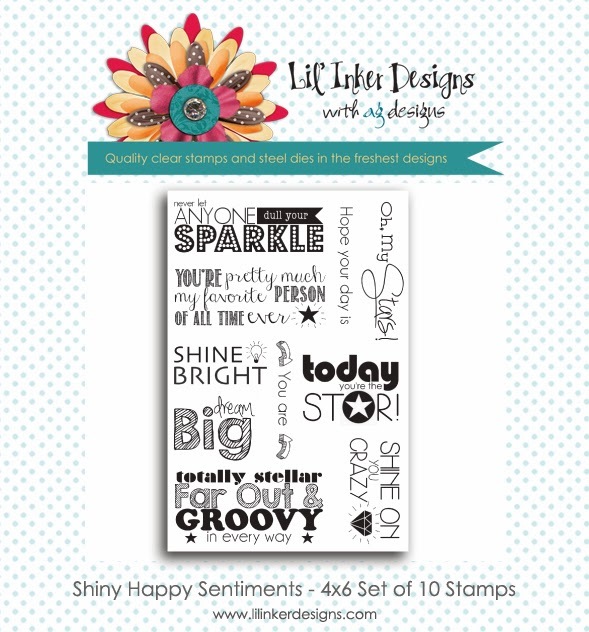 The sentiments from the new Shiny Happy Sentiments Stamp Set and the flourishes, also from the Notebook Doodles set, were embossed. I really like how well these two sets work together! So fun! Up next is a very simple card. This also uses the new Shiny Happy Sentiments Stamp Set. I LOVE the fonts and combinations in this set! I added some glitter with the Wink of Stella pen to the light bulb but my photo doesn't capture the shine. To finish it off I added a small piece of glitter tape to the side. Thanks for joining me today! Don't forget to leave a comment for your chance to win a great prize from the LID store! Your next stop on the hop is over to Karen's blog! Hello! 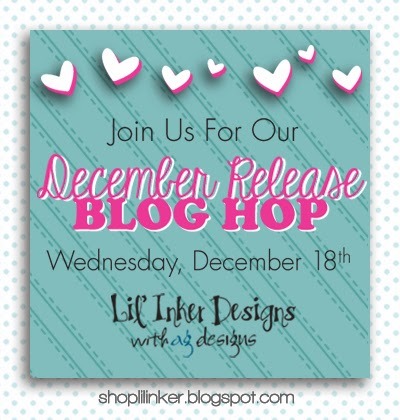 Welcome to the December Lil' Inker Designs release! Hang on tight because I think you'll fall in love with the products this month! If you are following along in the blog hop, you should have come from our guest designer's blog Jingle!! Isn't it wonderful to have her joining us this month! I can't wait to see everything she puts together! If you'd like to start at the beginning of the hop, visit Laura's blog. There are prizes up for grabs! To be eligible to win, just leave a comment along the hop. The more comments you leave, the better your chances are of winning! used the new Stripes Cover Up Die as an impression plate. I love how it looks this way! I used a copic marker to outline the bottom of the banner to help it pop out a little. I also used the new Floating Hearts Die to die cut a glittery red heart that I added under the sentiment. I really like the different sizes of hearts that you get with the Floating Hearts die! For this last card I used the Striped Cover Up Plate a little differently. I only used half of it and cut off what I didn't need (which actually cuts it in half and leaves a perfect amount for a second card!). That just took two tiny little snips with my scissors. I then masked my sentiment from the Love Things set and stamped it in Raspberry Fizz ink. The largest heart and arrows were die cut with the LID Of the Heart dies. I added a tiny little heart cut from the new Floating Hearts die to the center of the gingham heart and finished the card off by tying a piece of Blossom twine from The Twinery. Hello everyone! My mom's birthday was a few weeks ago and I made a card for her to celebrate her big day. I really like how the card turned out (MINUS my crooked stamping of the sentiment that I didn't even notice until after I assembled everything: just pretend I stamped it straight, OK?). 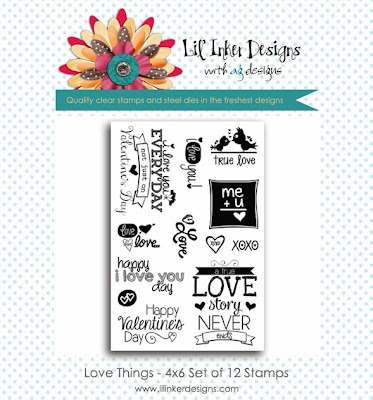 I used a lot of Lil' Inker Designs goodies on this card! I used the "On the Diagonal" die to create the angles for the striped paper. I LOVE this die!! I have used it in so many ways, so many sizes, for so many purposes! It is so fun! I also used the Mom Word Die for the die cut. I love how it cuts out the heart for the "o". The sentiment is from Mom Dad Sentiment set. I am so in love with that minty/turquoisey paper! It is from Michaels and comes in a multi pack. LOVE! Thanks for stopping by today! I hope everyone is staying warm! It has been freezing here lately! When I left for work last Friday it felt like -4 degrees with the wind chill. The highest I saw it get today was a whopping 17 degrees. BRRRRRR!!! I'm ready for a little warmer weather!